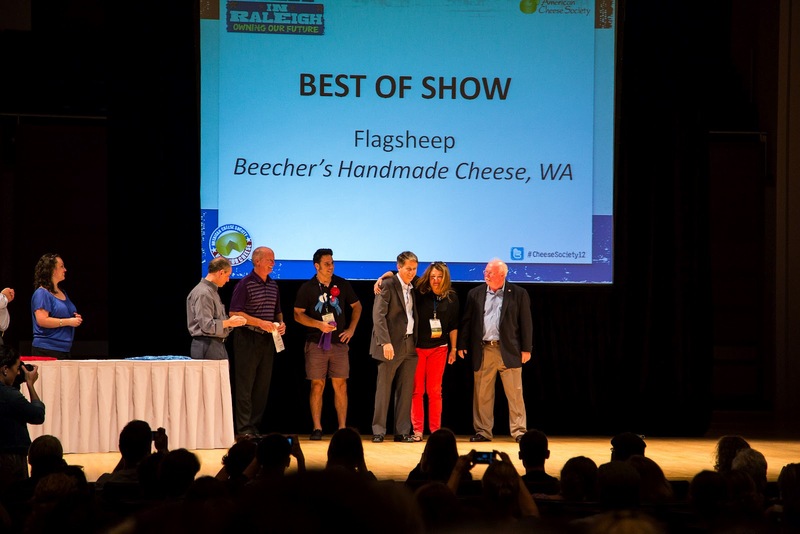 In a sign that mixed-milk cheeses are slowly and surely becoming American artisanal cheesemakers’ claim to fame, Beecher’s Handmade Cheese from Washington captured the 2012 American Cheese Society Best of Show award tonight with Flagsheep, a mixed cow and sheep’s milk bandaged cheddar. Of 1,711 cheeses entered by 254 different companies across North America, two more cheeses took top honors. Earning Runner Up Best in Show was Valley Shepherd Creamery from New Jersey with Crema de Blue, a cave-aged blue made from Jersey cow milk. Emmi Roth USA in Monroe, Wisconsin, took Second Runner Up Best in Show with its Roth Grand Cru Surchoix, an extra-aged Gruyere. The awards ceremony highlighted the growing diversity of American artisan cheeses, with new companies from Montana to Maine earning ribbons in categories once dominated by Wisconsin cheesemakers. It was great to see cheesemakers across the United States embrace the growing artisan cheese movement. Of course, several Wisconsin cheesemakers did very well. Perennial favorites Sid Cook of Carr Valley captured 14 awards and Francis Wall of BelGioioso Cheese was practically running laps around the auditorium trying to keep up with his company’s awards. Congratulations to all the ACS winning cheesemakers! I’m looking to celebrating with you all tomorrow night and eating your cheeses at the Festival of Cheese.